The United Nations High Commissioner for Refugees (UNHCR) today said it is very concerned about reports that rebels are putting pressure on those displaced by the deadly fighting in the far east of the Democratic Republic of the Congo (DRC) to return to their villages. Spokesperson Ron Redmond told reporters in Geneva that the agency has received reports that rebels associated with renegade general Laurent Nkunda are trying to prevent internally displaced persons (IDPs) from reaching a makeshift site in Rutshuru, close to the base of the UN peacekeeping mission in the DRC – known as MONUC – and pressuring them to go back. Recent fighting between Government forces (FARDC) and a rebel militia known as the Congress in Defence of the People (CNDP), led by Mr. Nkunda, has uprooted an estimated 250,000 people in the past few months, mainly in North Kivu province, which borders Rwanda. Also today, UNHCR condemned the “cold-blooded murder” of an aid worker with the Italian non-governmental organization (NGO) Voluntary Association for International Service, which took place in Rutshuru yesterday. Armed men ambushed the vehicle carrying the staff member, wounding another person as well. Meanwhile, the UN refugee agency is preparing for a possible new influx of refugees heading to Southern Sudan after reports of a joint military operation by Congolese, Ugandan and Southern Sudanese forces began Sunday to flush out the Ugandan rebel Lord’s Resistance Army (LRA) from camps in the remote Garamba National Park in north-eastern DRC. Thousands of Congolese refugees fled to Western Equatoria State starting in mid-September after “ferocious” attacks by the LRA in the Dungu area, in north-eastern DRC. Refugees reported at the time that many of their family members and friends had been abducted, killed and raped during the LRA attacks, according to the agency. 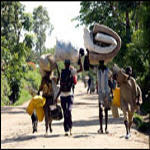 LRA fighters move frequently across the porous border between northern Uganda, southern Sudan and the north-eastern DRC. The group is notorious for its use of child soldiers during its conflict with the Ugandan Government since the mid-1980s, and several of its most senior figures have been indicted by the International Criminal Court (ICC) for alleged war crimes.